MONDAY-SUNDAY SPECIAL Served from 7:00 a.m. - 3:00 p.m.
Don't let hunger drag your day down! 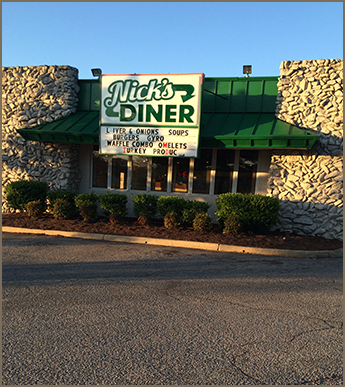 Stop by Nick's Diner for a fantastic array of homemade dishes for breakfast, lunch, and dinner. From omelettes and pancakes to steak and pasta, we've got it all. With our affordable prices, most under $10.00, enjoying a delicious filling meal doesn't have to drain your wallet. See what other diners have to say about Nick's Diner when you check out our testimonials page! Come as you are to Nick's Diner, serving up delectable dishes in a family-style atmosphere. At our American diner in Virginia Beach, Virginia, we serve all-day breakfast, lunch, and dinner after 3:00 p.m. Every meal is homemade to perfection with nothing frozen, not even our burgers. Wondering what to order? You could start off the morning right with our delicious French toast combo or West Coast skillet, washing it down with a steaming cup of coffee. For lunch or dinner, you're in luck because we have an array of meat and seafood options, along with salads and sandwiches. Be sure to ask about our home-style favorites, like chicken and dumplings or liver and onions. Up to 110 patrons can dine with us while enjoying our free Wi-Fi™. Reservations and walk-ins are accepted, and we also offer takeout. Plus, catering is available for any item off our menu. Please contact us to learn more. Monday, Tuesday, Sunday, 7:00 a.m. - 3:00 p.m.
Wednesday, Thursday, 7:00 a.m. - 8:00 p.m.
Friday, Saturday, 7:00 a.m. - 8:30 p.m.